Seventeen-year-old Palmer Luckey built his first prototype for a virtual reality head-mounted display in his parents’ garage. Just a few years later, he debuted the Oculus Rift headset at the 2012 E3 gaming conference. The device’s small size, high quality, and relatively low cost reinvigorated the video game industry’s largely stagnant efforts to bring fully immersive, 3D gaming to the mass market. A huge Kickstarter campaign to fund further development followed, adding to the VR buzz.
. . . into the eyes of the caged tiger, and on the scaly train of the crocodile, stretched on the sands of the river that has mirrored a hundred dynasties. I stroll through Rhenish vineyards, I sit under Roman arches, I walk the streets of once buried cities . . . and leave my outward frame in the arm-chair at my table, while in spirit I am looking down upon Jerusalem from the Mount of Olives. How could the stereoscope take Holmes on such incredible journeys? Through a principle called stereopsis, which allows inventions like the stereoscope (and today’s VR devices) to create the illusion of 3D from a 2D image. Your eyes see two slightly different versions of the world. Many of us learned this as bored kids. Remember this trick? Look at a stationary object in front of you. Close one eye, and then switch to closing the other. The object appears to move from side to side. Our brain combines the two inputs into a single image, giving us our sense of depth and the ability to experience the world in three dimensions. British scientist Charles Wheatstone first described this phenomenon in 1838. He also created a tabletop device that used mirrors and hand-drawn pictures to demonstrate the effect—the first stereoscope. The creation of stereoscopic technology dovetailed perfectly with the advent of photography. Stereographs, two photos of the same scene taken at slightly different angles and printed side by side, were developed for use in new handheld stereoscopes made with glass lenses. From the 1850s to the 1920s, companies produced hundreds of thousands of stereographs for purchase in stores, by mail order, or from door-to-door salesmen. At pennies apiece, stereographs allowed middle class families to travel the world from the safety and serenity of their parlors. 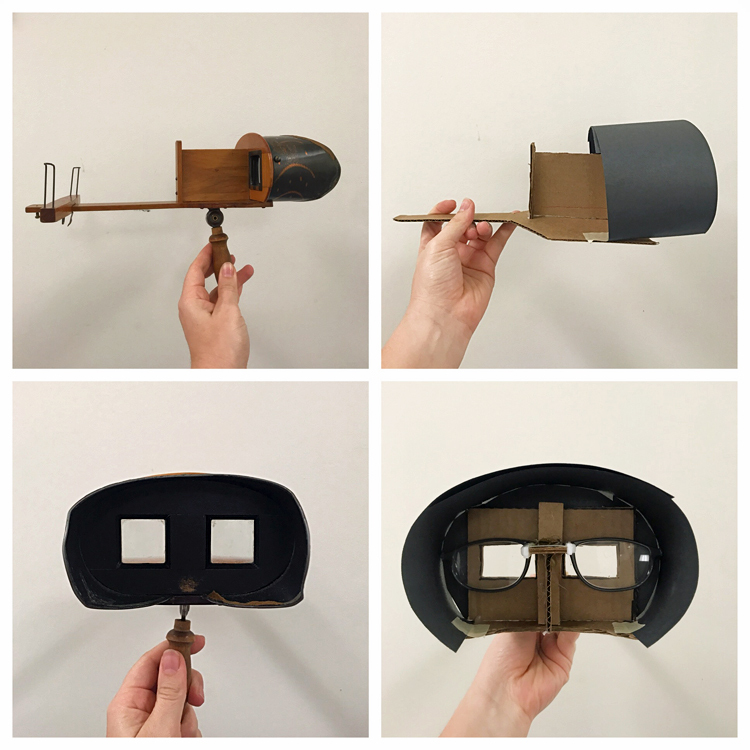 If you’d like to try the marvel of Victorian VR for yourself, check out the tutorial below to create your own stereograph and stereoscope. If you plan build a stereoscope, you’ll want something to look at! I suggest starting with this step. 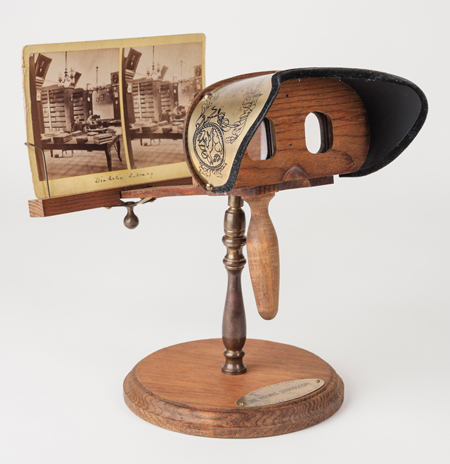 With a stereograph in hand, you can better test and tweak your stereoscope during the building process. If you would like to make your own original stereograph, you will use these same measurements when printing your photos. There are two options for taking the stereograph pictures. First, you can take the two photos by holding your camera steady, shifting your weight to your left foot, taking a picture, then shifting your weight to the right foot and taking a second photo. This approach will simulate the view from your left and right eye. For a more precise stereograph, take advantage of a smartphone app. I have no particular affiliation with the product, but did try and like “3DHolicCam” (available for iPhones). 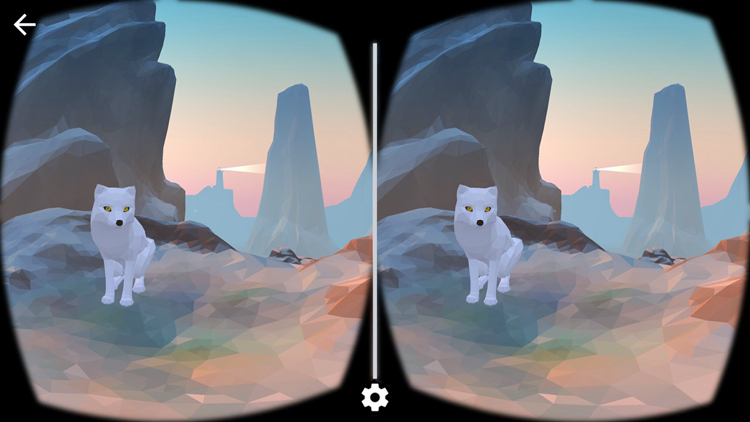 Now that you have a stereograph, let’s make something to view it with. I began with a tutorial by Make: magazine to create the lens piece for my stereoscope. The linked article explains how to repurpose reading glasses into a simple stereoscopic viewer. I didn’t have all the suggested tools; where the author called for drilling and screwing the lenses, I instead glued the pieces of the glasses to an angled piece of cardboard. My final stereoscope worked just fine with this adjustment. After making the lenses, I tested them with my stereograph. I held the lenses up to my eyes with one hand and the stereograph out in front of me with the other. When you try this, looking through the lenses should feel like crossing your eyes, and they should force the two images to converge on one another. You may need to move the card closer or further away from your face to get the images to overlap and focus. With my first attempt at the lenses, I found that the pictures were not overlapping at all. So, I separated the glasses pieces and tried a different angle on the cardboard connecting them. Even after this tweak, I still didn’t achieve perfect stereopsis. The images partially converged, but my eyes took in too much of the periphery around the stereograph and I found it difficult to get the illusion to work. To resolve the issue, I built a simple cardboard housing, modeled on a stereoscope we have at the museum. 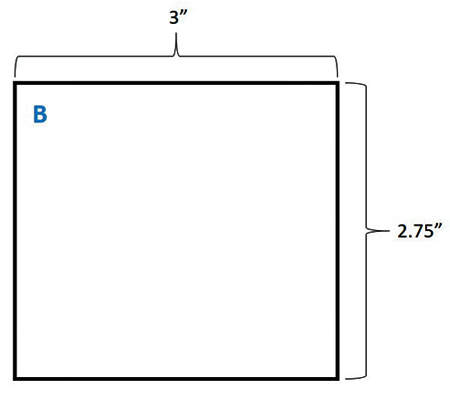 Cut cardboard into the three shapes shown below (parts A, B, and C), using the suggested measurements. Measurements for making Part A of the stereoscope housing. 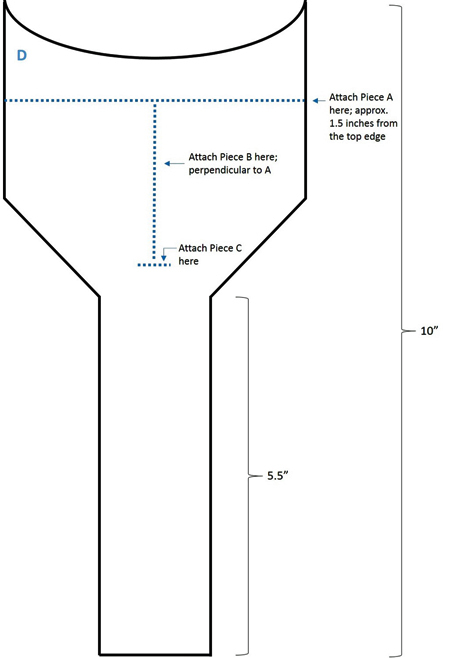 Measurements for making Part B of the stereoscope housing. Measurements for making Part C of the stereoscope housing. Attach Part B to Part A. You’ll glue the thin edge of B perpendicular to Part A, along the center line between the two eye holes. 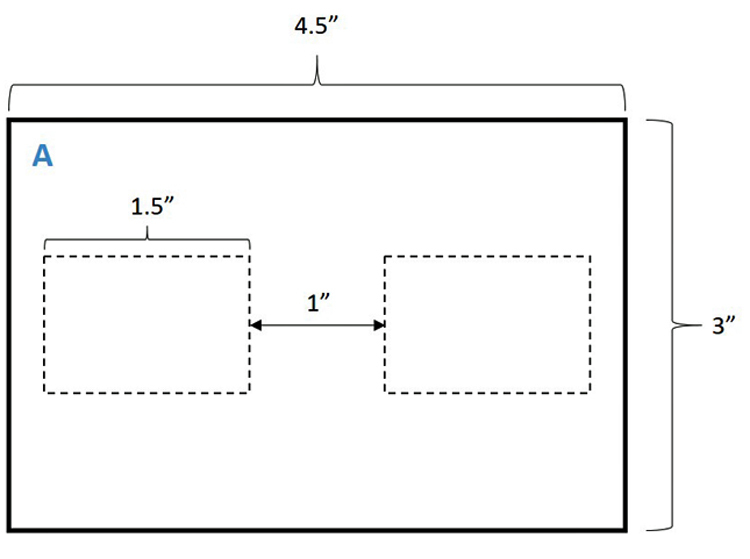 The assembled arrangement of Parts A, B, and C.
Cut a fourth piece of cardboard in the shape shown below (part D), using the suggested measurements. Measurements for making Part D of the stereoscope housing. Attach the combined parts A-B-C to part D, in the position shown by the dotted lines above. You now have your cardboard frame. Glue the lenses to frame. Attach them to part A. I also glued a few small scraps of cardboard underneath the lenses to support and hold them in place. Cut a 3.5” by 10” strip of black construction paper. Curve the paper over the lenses and cardboard piece with eye holes. When looking into the device, the paper should extend back from the lenses toward your face. It will help to block your peripheral vision. Glue the short sides of the paper to the bottom of the cardboard frame. There will be a few spots where the paper curves above the top and side edges of the cardboard piece with eye holes. Cut and attach scraps of construction paper to fill in these spots and keep the light from getting through.